You’d think that after last week’s controversial House speech by Israeli Prime Minister Benjamin Netanyahu, who denounced the president’s negotiations with Iran, that Republicans would show a little class and get off Obama’s back. Senate majority leader, Mitch McConnell (R) of Kentucky, tried to rush the bill to the floor but had to reverse course, after Democrats threatened to block the move. This week, Republicans doubled down on their destructive rhetoric. Republican Sen. Michael Willette refused to resign over a series of offensive Facebook posts. In the posts he suggested President Barack Obama's family members are part of the Islamic State group. When the Maine Democratic Party called on him to step down over what they described as a "prolific online history of racist and bigoted remarks," Willette backpedaled, said he was sorry, and that he won’t continue to post lies. Willette also posted a photo of Obama on Facebook pretending to use the president's words, saying of the Islamic State group, "I'll deal with them at the family reunion." It’s more than not having any class that makes Willette a problem. He’s admitted having animosity toward Muslims and suggested that members of Obama's administration are part of the Muslim Brotherhood. It’s apparent he hates the president, and that’s he’s graduated from hateful rhetoric to downright lies. Willette has gone too far this time. Speaking of going too far.. 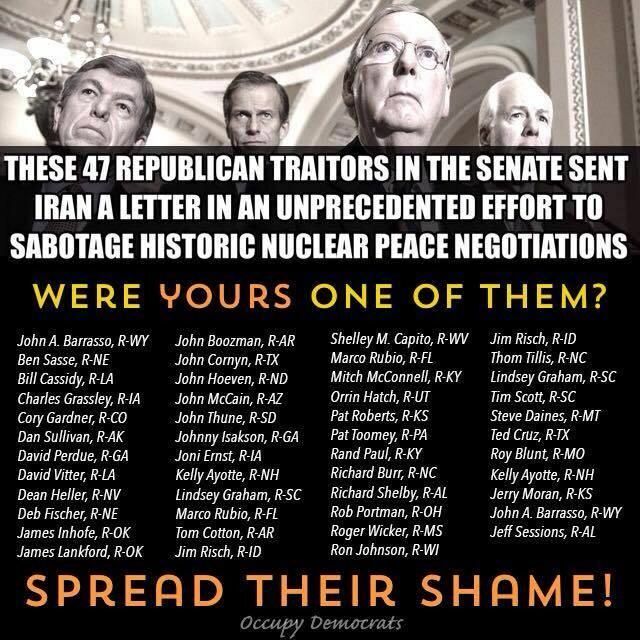 When those 47 Republican senators sent a letter to Iran’s leadership Monday warning them that an international nuclear deal with them could be scrapped if they didn’t like it, they went too far. Those 47 senators – including three potential Republican presidential candidates - broke the law, or at least violated the traditions of Congress, by directly engaging a foreign power on US foreign policy. Even some Republicans realize that the letter went too far. Negotiations with the Islamic republic "are tough enough here and I didn't think it was appropriate to add another element that makes it more difficult," Senate Republican Jeff Flake told National Public Radio. In both cases, there’s a total lack of respect for the president of the United States. Meanwhile, the world looks at the political dysfunction festering in Congress and wonders how united we really are.